An extension to Visual Studio "2017" Community (and other versions) which provides a convenient method for viewing and updating process templates. The Process Editor also provides tools for updating global lists and work item types, as well as viewing the attributes of work item fields. This tool was formerly provided via Team Foundation Server 2015 Power Tools (and earlier versions). This is a client extension which needs to be installed by each user locally for their own version of VS.
From the Work Item Types menu, you can open a WIT or import/export a WIT XML definition file. To learn more about work item types, see [Add or modify a work item type] (https://www.visualstudio.com/en-us/docs/work/customize/add-modify-wit). From the Process Template menu, you can open a process template and edit the various parts. To learn more about process templates, see [Overview of process template files](https://msdn.microsoft.com/library/ms243856.aspx). Just like the Work Item Types menu, from the Global List menu you can open a global list from a file or server, or import/export the XML definition file for a global list. To learn more about global lists, see [Define global lists](https://msdn.microsoft.com/en-us/library/ms194977.aspx). The Work Item Field Explorer opens the following window. You can’t edit or delete a field, but you can review all fields defined for the collection and the assignments made to all attributes--both changeable and non-changeable. Here’s a description of each of the attributes that the Work Item Field Explorer lists. Each attribute is linked to its corresponding WorkItemTracking SDK reference topic. (The HTML syntax for the following info can be accessed from this blog post: https://blogs.msdn.microsoft.com/visualstudioalm/2012/08/17/work-item-field-attributes-what-you-can-and-cant-change/) . Gets the collection of valid values for a Field that uses this field definition. You can change this by specifying a pick list or global list. 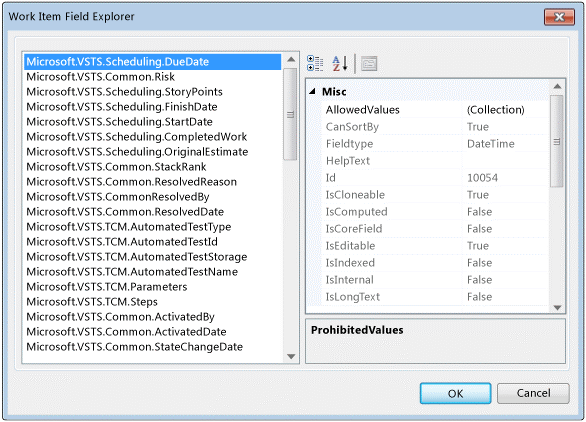 See Defining and Using Lists, Pick Lists, and Global Lists. Specifies whether work items within a query can be sorted by this field. Specifies the data type defined for the field. You cannot change this except for the PlainText and HTML data types. Specifies the help text defined for the field. You can change this for each work item type using the HELPTEXT XML element. Specifies the internal ID of the field. Indicates if the value set by this field is computed (True) or not (False). Examples of computed fields are ones that are set by the system, such as the ID, Revised Date, Changed Date, and External Link Count. Indicates if users can modify this field (True) or not (False). Examples of non-editable fields are ones that are set by the system, such as the ID, Revision, Created By, and Changed By fields. Indicates if the field is indexed (True) or not (False). When you enable indexing for a field, you may increase the performance of finding work items whose queries specify that field. If you add a custom field that you use in many of your work item queries, you may want to enable indexing for that field. Indicates if the field shows up within the set of fields you can add to filter a query (True) or not (False). Specifies the friendly display name of this field definition. Specifies the reference name of the field definition. Specifies the reporting attributes of the field definition. Specifies the type declaration: class types, interface types, array types, value types, enumeration types, type parameters, generic type definitions, and open or closed constructed generic types. Specifies whether the field is intended for use with work items or work item link objects. For more information about the Work Item Tracking SDK, see Extending Work Item Tracking by Using the Client Object Model for Team Foundation.